What would you think if your school told you that they had a plan to help your child with autism make friends and enjoy playing with them? Most of us have fond memories of times we enjoyed stretching our imaginations with our friends. However, we often find that our children on the autism spectrum have difficulties with play, especially when it comes to playing with people. What is it that they might be missing? Play is spontaneous, voluntary and intrinsically motivated. Play is about the process, not the end product. Play is flexible and changing – different every time. Play includes pretending and imagining. There is a developmental sequence to the ways that children play. Babies and very young children begin playing by manipulating the objects around them. They move on to “functional” play, where they imitate the way others use objects, such as cooking in a play kitchen or building with Legos. This is the beginning of pretend play – which becomes increasingly complex as children grow. There are also stages in social play. Babies and toddlers enjoy playful exchanges in social games like peek-a-boo. When they begin to have contact with other children, play with peers progresses from watching, to parallel play, to sharing a common focus and exchanging ideas and creating ideas together. Typical children move back and forth on this continuum as their social abilities grow. Like most developmental things, growth in play is not a straight line. When children play, their brains grow. They learn about relationships between objects, cause and effect, problem solving, planning, flexible and divergent thinking, and abstract thought. They learn new vocabulary, explore forms of language and culture, rules of conversation, and awareness of the power and pitfalls of communication. Play builds interest and understanding of stories, the ability to tell a story or anecdote, and teaches how we use symbols to represent the world. They grow socially too. They practice communication, perspective-taking, social awareness, and explore how trust, negotiation, intimacy and compromise work in order to form friendships. Play helps children explore their emotions, and how to express them in moments of joy and in conflict or stress. Play is a gateway to inventiveness and imagination. And it also helps children with physical growth, fine and gross motor skills, and sensory regulation. Play creates a zone where children can come to the edge of their capabilities and explore how they can do just a little bit more. 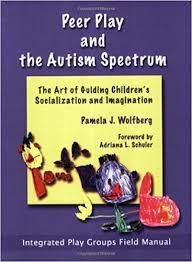 Autism is a social communication disorder. This creates barriers to full participation in play, particularly social play. Children with autism don’t know how to navigate interactions with their peers, and their peers often don’t know how to engage their autistic friends. As a result, children with autism have limited opportunities to build their play capabilities through the practice that they want and need. While children with autism do play in their own ways and benefit from it, they often remain in the earlier stages of developmental play far longer than their peers do. And the misunderstanding and lack of connection with peers can lead to harmful social situations such as bullying and loneliness. Peer Play and the Autism Spectrum: The Art of Guiding Children’s Socialization and Imagination is a book written by an award-winning researcher to describe the focus of her long-term research. Dr. Pamela Wolfberg began with a project: what if we could scaffold the play of children with autism and their peers, so that play activities are enjoyable for all the children? Dr. Wolfberg’s book describes the process for setting up a play group that includes 3-5 children between the ages of 3-11. It’s a detailed look at the planning process, gathering and preparing players, preparing the space and structuring the play section. She also describes what to look for in the children, and how to guide them into more thoughtful, responsive, and collaborative play. There is a lot of information here. The process needs an adult with the knack of observing and guiding, or at least the willingness to learn. But ultimately, all you really need is a group of children, an adult or two excited to try the process, toys related to the novice player’s interests, and a play space. Integrated Play Groups can happen in schools, daycares, community programs, or homes. They typically run with two sessions a week, for 6 months to a year. Each session is 30-60 minutes. The research is clear – in Integrated Play Groups, children with autism make gains in social interaction and play, which carries over to other settings and situations without adult support. Intriguingly, participants also showed progress in communication skills such as writing, speaking and drawing. Participants showed signs of enjoyment as well, including improvements in communication, responding to invitations to play, and collaboration. The typical children benefited as well, learning how to invite and include their play partners and learning that differences are interesting and okay. All the children found the sessions to be fun, and formed mutual friendships with their play partners that lasted beyond the play group sessions. In California, Dr. Wolfberg has founded the Autism Institute on Peer Socialization and Play, which continues to do research and offers training and teaching materials. The Friend2Friend Social Learning Society is in Vancouver. This innovative organization also offers training as it supports integrated play groups and autism awareness programs in British Columbia and beyond. Wouldn’t it be great to have something like this in Manitoba?